Many people collect U.S.Navy rating badges and many other folks collect ephemera. Still other collectors pursue metal insignia and uniform devices. But the question I have is, how many of them combine all three “genres” of militaria collecting into one, singular focus? As a ten-year veteran of the U.S. Navy and an amateur military historian, I’ve researched a vast number of subjects ranging from basic minutia to emotionally gut-wrenching and personally significant stories with historical context that I find utterly fascinating. During my naval career, I performed my job without so much as a fleeting thought regarding the historical aspects of my chosen specialty. Navy enlisted men and women receive schooling and training to perform specific job functions to meet the needs of each unit or command. 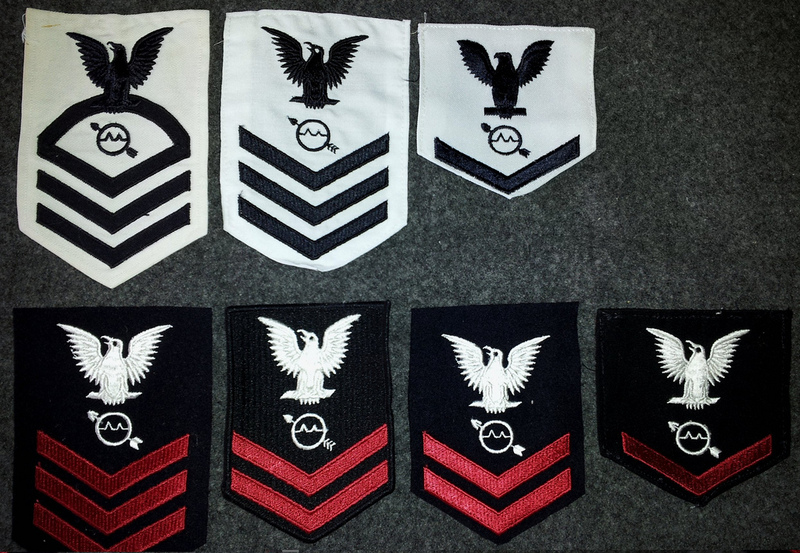 These ratings (similar to the Army’s Military Occupational Specialty or MOS) are denoted on each sailor’s sleeve insignia with a unique emblem symbolizing certain characteristics of that specialty. My own rating, Operations Specialist, seemed to be (to me) quite ordinary and less historic as compared to traditional ratings such as boatswain’s mates, gunners mates and machinist mates. I was none too interested in discovering any of the historical aspects or the development of my rating beyond what was presented in my training manuals. Other than the basic historical narratives (also presented in the training manual) regarding the history of naval radar, I didn’t give it much thought. Despite this lack, I did manage to excel at my job and advance in a timely manner. 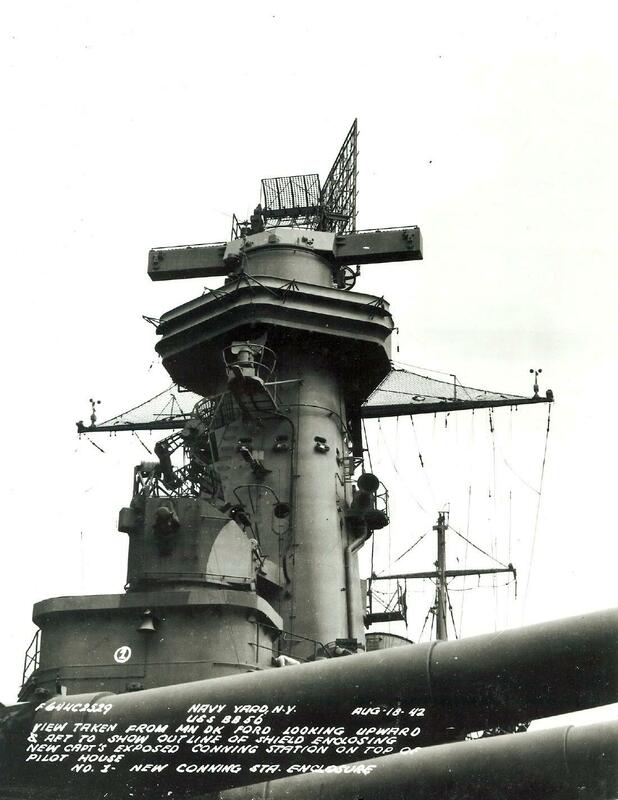 The foremast of the USS Washington (BB-56) showing the SG radar antennae on the foreward face of the tower. As documented in Muscant’s book, the placement of this unit was cause for a significant sector blindspot, leaving the ship vulnerable during the first Naval Battle of Guadalcanal in November of 1942 (U.S. Navy image). What turned me onto the historical backstory of my rating was an insignificant story that I read about the installation of radar onto the USS Washington (BB-56) as told in the pages of Ivan Musicant’s 1986 book, Battleship at War: The Epic Story of the USS Washington. What was revealing to me was how radar was installed onto the ship and essentially turned over to untrained operators and technicians. In his book, Wahoo: The Patrols of America’s Most Famous World War II Submarine, Medal of Honor recipient Admiral Richard O’Kane made considerable mention of the submarine’s unreliable radar and the continuous need for the boat’s radiomen (the technicians and operators) to service the wonder-device. Both of these books planted a seed that my navy job had an important history that was berthed during World War II and developed into a key job function in today’s radar-reliant naval service. Radarmen can trace their beginnings to the Electrician’s Mate (EM) rating. 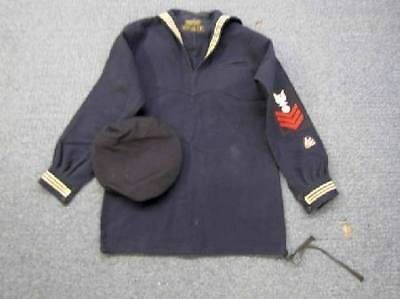 This World War I era EM first class bears the distinguishing mark indicating that the sailor was a radio operator and technician. Shipboard radio technology was in its infancy at this time and in the ensuing decades, a specific rating would be created. When I added the activity of collecting to my interests, I cultivated a new desire that prompted me into new research directions. One could say that when I was bitten by the rating badge-collecting bug, my interest was tempered by context. I focused on ratings that had connection to me such as my grand-uncle (post-WWI musician), grandfather (ship’s cook), brother-in-law (machinist’s mate), two uncles (radioman) and my own. Along with those rating badge pursuits, I picked up some of the more highly sought-after rates whose ranks were filled by more than their share of heroic blue jackets, such as hospitalmen, aviation radiomen. However, I found myself drawn to the historical aspects of my own rating, originally known as ‘Radarman’. This EM/1c rating badge dating from the WWI time-frame shows the four electrical sparks of the radio operator/technician distinguishing mark affixed directly below the bottom chevron. The Radarman rating (abbreviated as RdM) was officially established in 1943 after radar became more widely adopted aboard ships and submarines, and was at that time finding its way onto naval aircraft. The demand for highly skilled and trained operators and technicians prompted the Navy’s Bureau of Personnel to create a program to send qualified personnel to the fleet to better utilize the secret weapon. The rating badge that was subsequently created employed a borrowed feature from the radioman rating as it referenced the close connections to the communications technology. Also, many of the early Radarmen had previously served as Radiomen. The badge symbol used the electrical spark bolts (three rather than the four seen on the Radioman’s insignia) with an overlaid arrow indicating the directional detection aspects of the job, indicating the rating’s origins and the technology from radio. 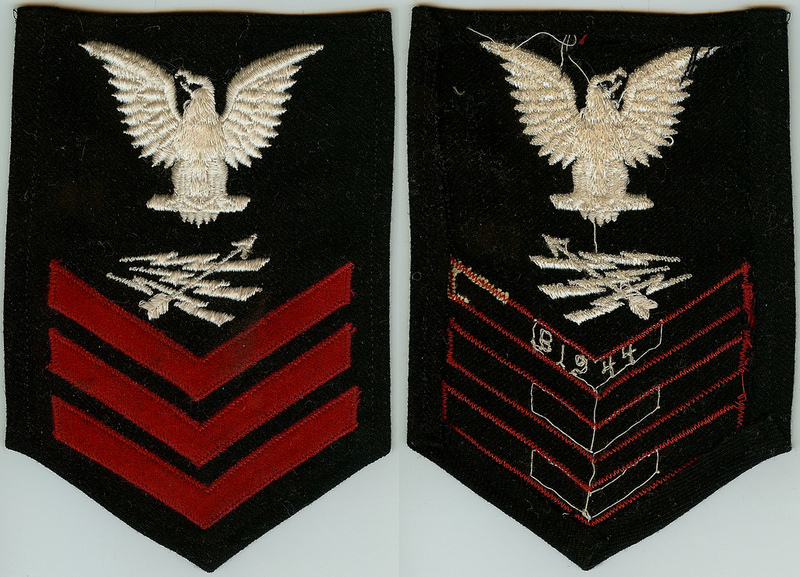 This Radarman first class rating badge is date-marked with “1944” embroidered on the reverse of the first chevron. In 1946, the Navy updated the insignia, incorporating the oscillator symbol while carrying over the arrow insignia. In 1973, change impacted this rate once again as BUPERS split the rate, removing the technicians (rolling them into the electronics technician rate) and those who were skilled as Electronic Warfare (ESM, ECM and ECCM) specialists as EWs. Those who remained were re-designated as Operations Specialists (OS) yet the rating badge remained and continues at present. A selection of my Radarman rating badges. All are from during and immediately following the end of WWII. 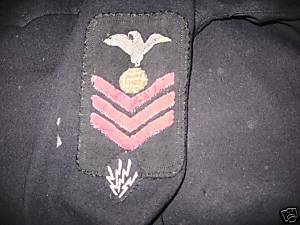 My collection of OS militaria began with what remained from my time in the service: insignia that was never applied to my uniforms. I began to pursue badges from WWII and worked my way forward to the 1960s and 70s as I picked up some special bullion versions. I searched for insignia from the rating’s roots and then onto ephemera, such as rate training manuals from several eras. I have managed to save some of the tools of the trade in the area of navigation, such as compass and dividers, parallel rulers, and nautical charts. I am still seeking an OJ-194 NTDS (Naval Tactical Data System) console for my office (OK, perhaps this would be overkill). Following the war, the Navy broke away from the lightning bolts of the radioman rating and embraced the oscilloscope and maintained the arrow of the original badge, By the early 1970s, the rating was split out – segmenting the technicians into their own rating (Electronic Technicians or “ET”) and the electronic warfare operators (EW) into their own. Radarman was disbanded in favor of Operations Specialist. I always keep my eyes open for anything that might augment this collection without breaking my budget or fill the floorspace in my home. At some point, I would like to assemble this collection in order to create a well-rounded display that is representative of this rating. 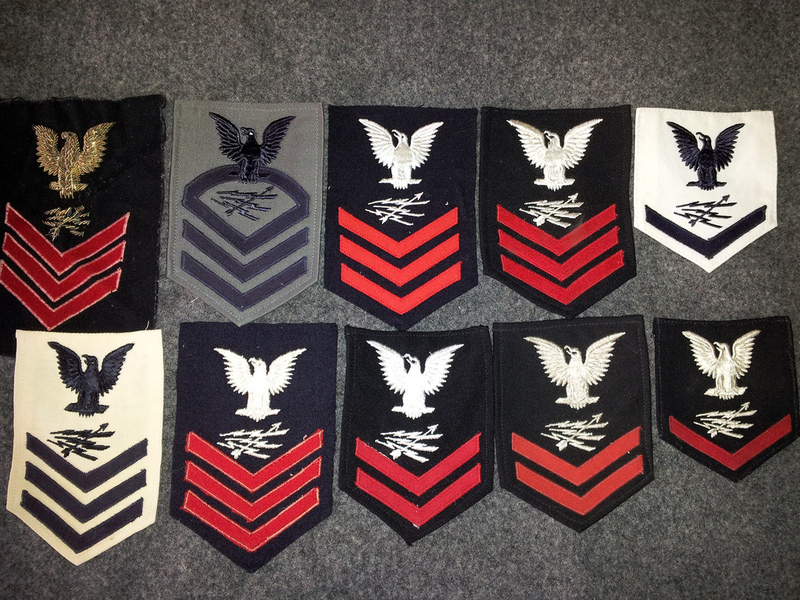 Posted on March 8, 2016, in General Militaria Collecting, Insignia and Devices, Rates and Ranks, Uniforms, US Navy and tagged Distinguishing Marks, Electrician's Mate, Electronic Warfare Operator, Naval History, Navy Ratings, Radarman, Radio Operator, Radio Technician, Radioman, Rating Badges, SSI, USS Washington. Bookmark the permalink. 9 Comments. Very interesting article on the development of the Radarman rating. I am interested in obtaining Radarman 3 & 2 and a 1 & Chief training manuals from the 1968-1970 time period. If you can help or know where I can purchase them, please contact me at ght77@bresnan.net Thank You. I have seen rate training manuals for RD, spanning as far back as the 1940s (I have a set from post-WWII) get listed on eBay with some measure of regular apperances. You just have to create a search that notifies you when someone creates a listing. Otherwise, you might have to check Abebooks.com to see if a used book dealer has listed something in their inventory, on that site. Patience and diligence should yield the desired results! I just Found out my Grandfather was a radar man and he went to the school in Columbus Ohio in 1955. He was in the Marine Corp though and graduated as a radar man 3. Is his insignia the same? Did he wear that symbol/patch on his sleeve as a marine? Though there certainly exists evidence of Marines affixing (U.S. Navy-style) specialty marks to their uniforms, it was never officially authorized. By 1944, it was expressly forbidden in regulations due to its sporadic adoption and somewhat lax enforcement of existing uniform regs within some commands. By the time your grandfather graduated, there would not have been any usage of marks.